"A delicious twist on traditional pinwheels that make for a fast and filling breakfast or brunch food." Heat a large skillet over medium-high heat. Add corned beef hash and break up larger chunks. Cook until browned on one side, 5 to 8 minutes. Turn and brown other side. Sprinkle with garlic powder and ground pepper. Transfer to a paper-towel-lined plate. Spread 1 dough sheet out onto lightly greased sheet of waxed paper. Spread half of the cream cheese over the dough sheet, leaving a 1/2-inch margin all around. Spoon half of the cooked corned beef hash evenly over cream cheese. Roll dough up into a log, starting at a long edge. Repeat steps to make another log with second dough sheet. Cut each roll into 1/2-inch thick slices (you should end up with 16 rolls total.) Place slices onto an ungreased baking sheet. Bake in the preheated oven until pinwheels are golden brown, 12 to 14 minutes. Serve immediately. Do not spread out dough too thinly on work surface, or it will be harder to roll up. 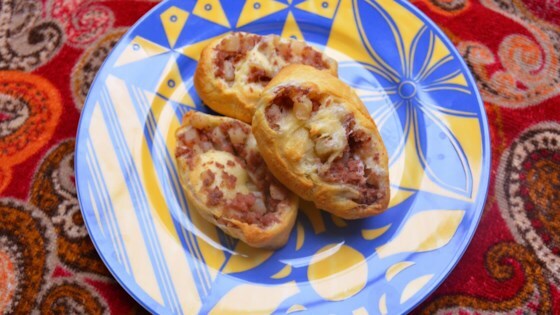 If dough seems too mushy after filling it with the corned beef hash, wrap rolls tightly in plastic wrap and refrigerate for 30 minutes before baking. These can be made ahead of time. Prepare the rolls and refrigerate the night before. In the morning, slice the rolls and bake. Easy and fun breakfast recipe! I love having an alternative breakfast idea and will be making this again.